Built with advanced media processing, secure domain partitioning and innovative vision processing, the i.MX8 applications processor family revolutionizes multiple display applications, industrial systems, vision, HMI, and single-board computers. It is ideal for high-performance, media-rich mobile device, mission-critical industrial applications, medical devices, and more. Step by step instructions on how to evaluate SX-PCEAC2 with NXP's i.MX 8 EVK. Why SX-PCEAC2 is the preferred solution for media rich, high bandwidth applications? Learn why SX-PCEAC2 is an ideal solution for your application that requires higher bandwidth. This video demonstrates how customers can now evaluate our enterprise grade Wi-Fi plus Bluetooth module with the NXP i.MX 6SoloX Sabre Smart Devices (Sabre-SD) evaluation kit. Silex presents the SX-BR-4600WAN, an Enterprise classs Ethernet to Wi-Fi bridge solution in this slide cast. Silex discusses the device connectivity solutions for document imaging, including printers, multifunction printers and scanners. This video demonstrates how easy it is to connect connect and share HP USB Scanjet Scanners on a wired or wireless network. In this video show how to allow multiple computers to connect and share USB or Multifunction printers on a wired or wireless network. This video demonstrates how printers, scanners, disk drives, card readers, or virtually any other USB device can be enabled with network capability. Step by step instructions on how to enable Wi-Fi connectivity for your i.MX 6 Platform. Silex Technology is a NXP Proven Partner and the only manufacturer of NXP-recommended wireless connectivity technology. 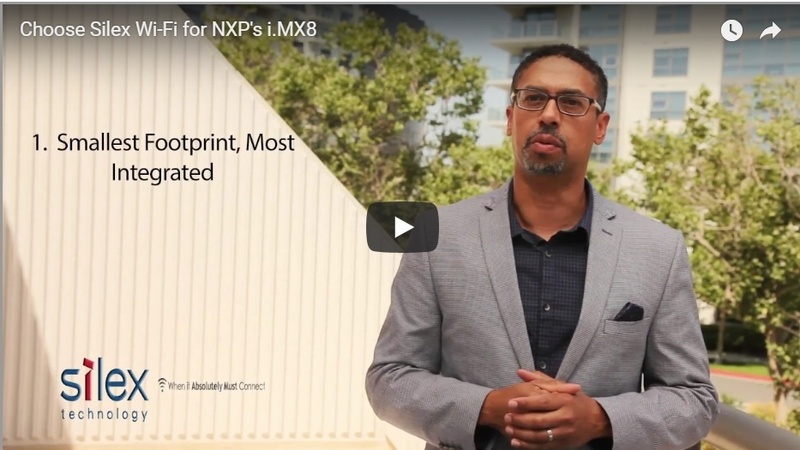 Silex Technology, a Qualcomm Atheros Desgin Center, collaborates with NXP to add Wi-Fi connectivity for its i.MX 6 platforms. This video demonstrates how customers can now evaluate our industrial grade PCIe Wi-Fi module, the SX-PCEAN2, a dual band mini PCIe radio module with the NXP Sabre Smart Devices (Sabre-SD) evaluation kit. We have created an evaluation image using the open source ath9k driver. This video demonstrates how you can evaluate the SX-SDMAC enterprise grade Wi-Fi plus Bluetooth module with the NXP i.MX 6SoloX Sabre Smart Devices evaluation kit. SX-SDMAC is a dual-band IEEE802.11a/b/g/n/ac WLAN plus Bluetooth 4.1 BR/EDR/BLE “Smart Ready” SDIO module based on the Qualcomm Atheros QCA9377 SoC. Qualcomm talks about how they work with NXP and Silex to provide OEM's the perfect platform to integrate Wi-Fi and meet their products’ toughest features, performance and power requirements. Keith Sugawara talks about Silex Technology's Wi-Fi connectivity solutions i.e. radio module and how that connects to the Freescale i.MX family, at Freescale Technology Forum (FTF). This video shows how the Silex SVL display for education creates an immersive classroom learning experience. In this video, we multi-cast the same content for timely announcement or emergency attention. This video shows different content for each display with a single receiver.